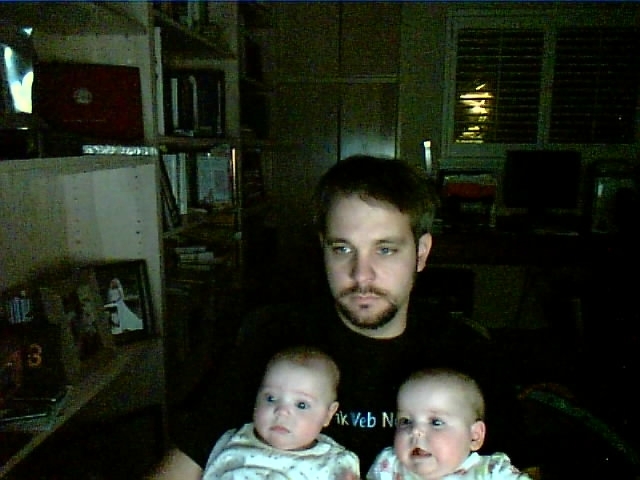 Sleeping was obviously not on the agenda in this webcam photo from December. A week ago Lilly stopped being an observer and reached for the keyboard. In the above clip I am obviously a very proud father. Her banging opened a few programs including Notepad, resulting in arguably the most important character string every typed. 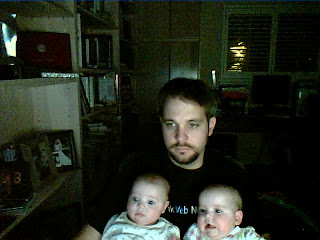 I am sure I have broken some parenting rule by having the girls occasionally hang out on my lap while I use the computer, but Lilly has obviously learned from the experience. I would love to give the girls a keyboard to play with but at this point I would be afraid of them swallowing one of the keys. For now it will be fun to let them occasionally bang on the keys in a supervised setting. I would feel remiss if I did not point out that at home I use a Microsoft Natural Keyboard Elite from 1998, while not as loud as the 1984 IBM Model M I use at work it still has a nice clickety-clack sound. For those of scratching your heads, I am not the only programmer with a keyboard addiction preference.